On my character I just colored his hair solid brown. If you can post an example of the steps that you take, that would help me the most. 2. fill in outline with solid brown. let me know what you do differently. I found this a long time ago but found it very helpful. It is for realistic hair (and fur) but what I learned from it has translated to my digital paintings. 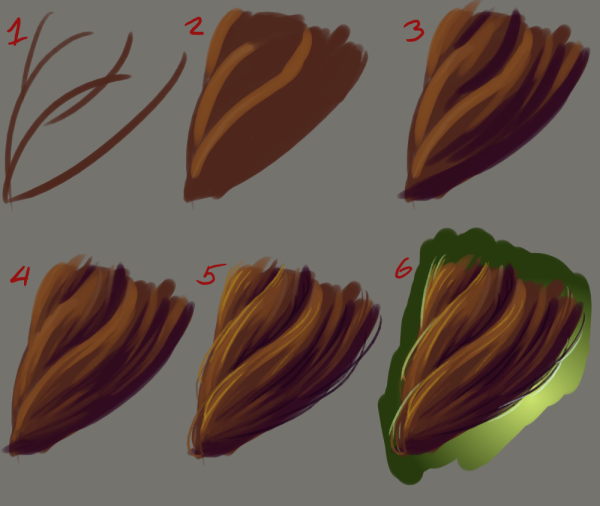 Learning how the hair flows and its positive and negative spaces was really great for me. Take a look through it, its only a couple pages. If nothing else its really great artwork! 1) The key to good hair is not to draw individual strands, but instead approach it as if each lock were a 3 dimensional shape. You want to shade it the same as you would a cylinder or a sphere. Start by drawing out your large shapes. 2)Block in your solid colours and a few midtones to help you keep track of where your shapes are. 3)Add Shading. I'm using a medium hard brush with a moderate size to cover a decent area. 4) Using a smaller soft brush work out the edges of the solid colours. You want a decent amount of tapering and just a slight indication of a hair. Don't get too detailed or the strokes won't be balanced. 5) The last and fastest part of the process is going back in with a tiny hard brush and making a few bold strokes in key areas. This is what screams 'hair' and you didn't have to draw a thousand pencil strokes to do it. Don't be afraid to throw in a few stray hairs, since this makes it look much more realistic. 6) If you happen to have a dark background and a light behind your character you can also add in a little bit of subsurface scattering to bring focus into certain parts of the art. This should be used extremely sparingly though. Too much looks forced. Hope this helps. The key is to see it as a 3D object.